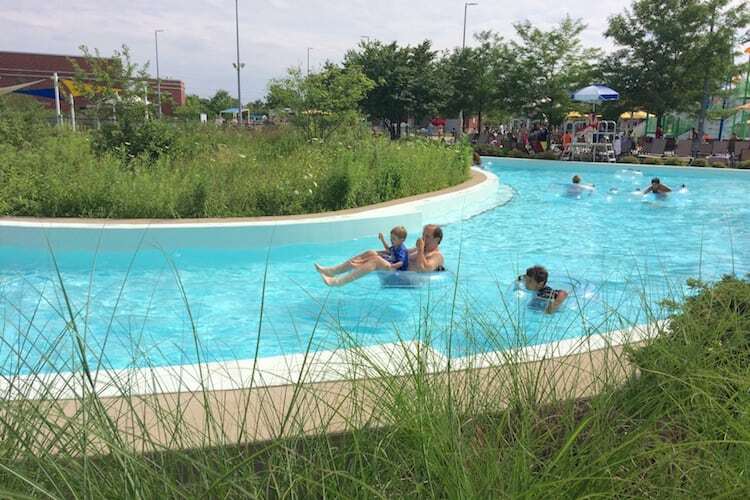 Home > Around Town > The Waterpark at the Monon Community Center This Carmel waterpark makes a big splash in Hamilton County. The Waterpark at the Monon Community Center This Carmel waterpark makes a big splash in Hamilton County. Summer is here, and so is waterpark season. When the temperatures rise, one of the places my kids and I like to cool down is at the Monon Center Waterpark, a 3.5-acre aquatic experience located in Central Park in Carmel. Even though my kids are relatively young and just starting to learn how to swim, there are so many fun activities to do that keep us busy from the time the park opens until it closes. One of the new features we were looking forward to experiencing was the Activity Pool, because it had been redesigned and included a new 12-foot waterslide. My oldest son, who is just starting to venture out more into the water, had a blast sliding down the slide over and over, splashing down into the shallow water below. The Activity Pool also includes a dozen new spray features that are perfect for kids who love to get wet! The Kiddie Pool, which is located inside its own gated area, is a section of the waterpark that my youngest son loved the most. This section is for tots who are 48 inches or shorter. The water here is very shallow (a little over a foot deep), and there is a small waterslide and a water activity table here. For more adventurous kids who are 48 inches or taller, the FlowRider is a great way to surf some waves without even having to visit the beach. There is also a plunge slide that, as the name suggests, plunges you straight down into 12 feet of water. Next to the plunge slide is a rock-climbing wall, where experienced swimmers can try their hand at scaling the AquaClimb as far up as they can go. When it’s time to relax, a float down the Lazy River is the perfect place to do so. My kids and I grab an inflatable “donut” (as my kids call the inner tubes) and gently float our way around and soak up some sun. The waterpark provides plenty of chairs and places to sit if you want to watch all the fun from the comfort of your seat. If you can swing it, I highly suggest renting one of the waterpark’s 14 covered cabanas, which allow you to have your own little space. Each cabana comes with a safe to store your personal belongings, comfortable seating, ceiling fans and phone chargers. * The Monon Community Center Waterpark can get busy during the summer, so when it reaches full capacity, staff may implement a one in/one out policy for non-members. During this time, non-member guests will be permitted into the waterpark one by one as other guests leave. * Towels and goggles are not provided, so pack your own! However, the waterpark does provide life jackets to use while in the park. Nicole Sipe is a freelance writer and editor in Indianapolis. A Southern California native, she enjoys exploring Indy with her husband and two sons.